The management of the B&B Contracting Group is consciously committed to providing a safe and healthy environment in which employees may work safely without fear of accident or injury. B&B’s health and safety program is developed, implemented, and maintained to ensure compliance with BC Workers’ Compensation Act and Occupational Health and Safety Regulation. B&B is committed to work in a spirit of consultation and cooperation with workers and will conduct programs of education and instruction in safe work practices and methods in order to promote the health and safety of the workforce – programs in which all employees will participate. B&B recognizes the right for all workers to work in a safe and healthy environment and will aggressively pursue the attainment of such a workplace for all employees and others working on B&B worksites. B&B strives to set an example in safety for the industry. The Certificate of Recognition (COR) is a voluntary program that recognizes companies who develop and implement health and safety and injury management systems that meet an industry standard. 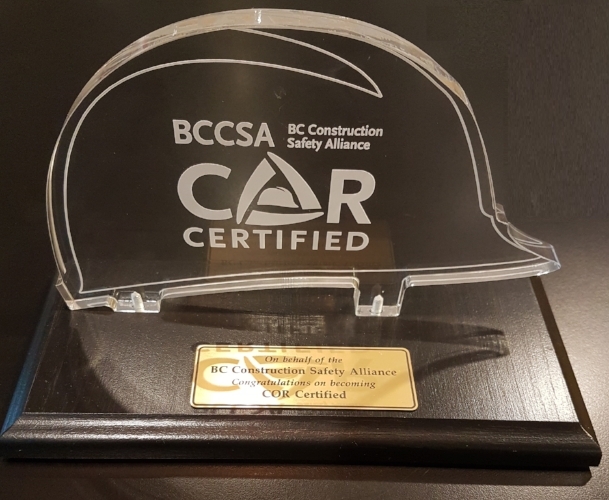 B&B has been COR Certified for five years and employs a highly qualified Health and Safety Team to create, administer, and maintain our comprehensive Occupational Health and Safety Program and our Injury Management & Return to Work Program. Being COR Certified helps demonstrate B&B’s commitment to protecting the well-being of our workers and maintaining a positive culture of safety on all of our worksites. B&B has also met all requirements for ComplyWorks and ISN Networld which allows clients who use these services to have peace of mind in knowing that we have completed the rigorous application processes involved in certification. Additionally, B&B continually maintains active and good standing status with WorkSafeBC.